The color of choice for Rosie is Black, a timeless classic. Starting from the rear we have a bimini with a sail trim window, this is actually off white to reflect the sun but with a black strip to tie in with the rest of the boat. We have three screens that zip into the bimini and each other and snap onto the cockpit combing to fully enclose the cockpit, these are also off white. The bimini attaches to the dodger with a zipper making removal of the bimini for sunbathing or star gazing a 2 second job. The dodger is black with big clear windows providing unobstructed 360 degree views from behind the steering wheel. It has a large 'smiley face' zippered opening to allow good airflow, this also has a fly screen option. The dodger has large stainless hand holds on the side plus a frame of solar panels on its top that adds permanence and rigidity. Both the dodger and bimini were custom made brand new in 2001. 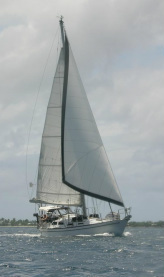 The mainsail has a black sunbrella cover which snaps below the boom and zips in front of the mast. Both of the roller furling head sails have strips of protective black sunbrella sewn onto the sail, both new in 2002. Although the head sail sunbrella is in good condition some of the stitching will need to be run over again by a sailmaker. One of the few negatives of having a cutter rig is the chafe the head sail performs on the staysail sunbrella stitching when tacking. Spare black and white and fly screen material for repairs/new items.